February has traditionally been a bit of a lifeboat in the ocean of the winter movie season, and this month is starting out as no exception. While they might not be the biggest blockbusters, all three of the new wide releases this weekend present a rational case of why someone would willingly see them (I'm still trying to get my head around Kangaroo Jack, even though I predicted it). 2000's Shanghai Noon was arguably both a surprise and a disappointment, opening on a very crowded Memorial Day Weekend to about $15 million but finishing up at just $56 million. It was a solidly entertaining film, though, and apparently found enough fans to warrant a sequel. Shanghai Knights (I still hate that title; it misses the point of the original) comes following what may be the weakest efforts ever for both Jackie Chan and Owen Wilson (The Tuxedo and I Spy, respectively). This makes this reteaming fairly prosaic as both could badly use a hit. Recapitalizing on their easy chemistry from Shanghai Noon would seem to be an easy way to break out of their slumps. 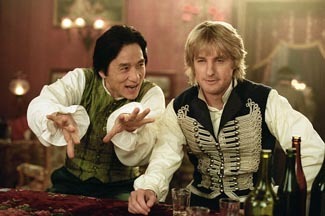 Shanghai Knights snuck two weeks ago, and let me tell you something; this is one strange movie. Good strange or bad strange is really in the eye of the beholder but there's no denying this is not your typical comedy. Wilson and Chan have only improved their chemistry, which only helps the film. The movie itself does have quite a bit of fun with its London setting and the 19th century tech, though it has a bit too much fascination with shoehorning every historical detail about period London. One major plus in Shanghai Knights' favor are the fight scenes. Jackie Chan has finally gotten control of the choreography for an American film and has provided this one with some of the most entertaining and funny fight scenes since he started making movies in Hollywood (too bad the director felt the need to set off signal flares for some of the jokes). Out of the shadow of the timeframe of its original release, Shanghai Knights should definitely best the opening weekend total of the original, though not by a huge margin. Launching in 2,753 venues, Knights looks to be on pace for a $17-18 million weekend. The two other competitors for new dollars this weekend are romantic comedy entries, though they're not necessarily in conflict with each other. How To Lose a Guy in 10 Days and Deliver Us From Eva (What is it with the titles this week?) exist in different universes as far as the release patterns go, with 10 Days being the widest release at 2,923 venues and Eva at a modest-if-typical-for-black-films 1,139 locations. 10 Days gives us Kate Hudson and Matthew McConaughey (who's becoming the cinematic equivalent of being whipped). Eva has Gabrielle Union and LL Cool J. 10 Days wants to be a screwball comedy. Eva wants to be the latest "modernization" of a Shakespeare plot (a pretty transparent Taming of the Shrew). I don't know about anyone else, but I'm getting romantic comedied-out, and I don't even go to these films. Neither of these films look either remarkable or unique, but then they don't look terrible either, plot flaws aside. Kate Hudson's definitely a rising star and Gabrielle Union is still able to carry herself on her Bring it On mojo. These movies should both find their audience but neither should be world-beaters. How To Lose a Guy in 10 Days should grab about $13 million, and Deliver Us >From Eva should be able to find room in the $9 million range. I wouldn't be surprised at long legs for either, given the genre's forgiving nature. After teasing and playing around for weeks with a mid-level release, Chicago finally gets what can seriously be called a national release, nearly tripling its screens to over 1,800. It certainly hasn't suffered, earning $50+ million to this point and decaying very slowly in box office as word-of-mouth carries it. It's pretty safe to say that the movie musical is back, at least in some form. With several Oscar nominations including Best Picture surely in the bag for Tuesday's announcement, this launch does have a certain timing to it, though the chance at a first place ranking in the box office is probably gone. As it is, Gere, Zellweger, Zeta-Jones and co. should add another $12 million to their box office coffers. This weekend total should keep Chicago ahead of all three releases from last weekend, only one of which has a reasonable chance of not falling like a stone. The Recruit, which took last weekend's number one spot, is likely to drop the least, given Final Destination 2 and Biker Boyz's front-loaded genres. Recruit should stick around the $10 million mark, while the panned Destination and Boyz should plummet, possibly seeing over 50% drops. The Lord of the Rings: The Two Towers makes another milestone this weekend, as it will pass Harry Potter and the Sorcerer's Stone in the all-time box office race and move to ninth all time. It's shown a real resilience in the last couple of weeks after big drops early on. With its Oscar hopes still to come, this could continue to be a top ten film for some time.